1. Annabelle strikes a pose. 6. Sifu Phil and cast receive a standing ovation for their performance. 2. Annabelle delivers a flying sidekick to Keith Voney during our stage production of "The King and I". 7. "Little Bo" and his cronies. 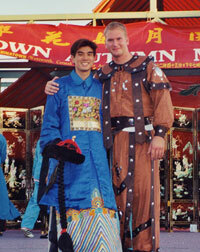 3.. Sifu Phil and Instructor Keith. 8. 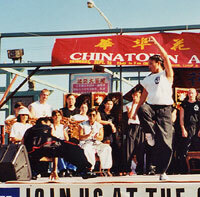 Sifu Phil directs the cast during a dress rehearsal. 4. 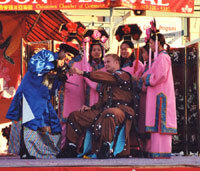 A shot of the cast during a dress rehearsal. 9. Sifu Phil oversees the martial arts choreography. 5. 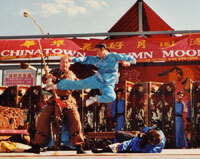 A publicity photo of the cast in Chicago's Chinatown Square. 10. "Little Bo" pours wine for the evil "O'Brian" (played by Instructor Keith Voney) in an attempt to get him inebriated.